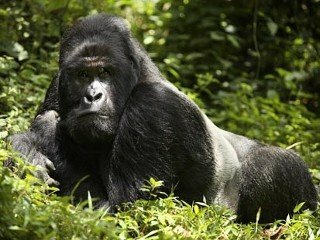 NShonji gorilla group is located in Rushaga part of Bwindi Impenetrable National Park. You will therefore need to drive to Kisoro and look for accommodation. Habituation of this family begun in early 2007, and it was officially launched for tourism on 26th September 2009. This family is unique in that it has 36 individuals (at the last count) and growing, with the silverbacks and blackbacks living in relative harmony. Most gorilla families usually comprise about twenty individuals, with the oldest male silverback leading the group. In the case of this silverback dying, the group will usually split up between the eldest silverback (or the more dominant silverbacks) as was the case in the Habinyanja family. There are some cases where an older silverback can be ‘overthrown’ by a younger, stronger silverback as happened in the Rushegura and Kyaguriro families. It is therefore a distinctive feature of this family to have three silverbacks in the group and seven blackbacks. Even more astonishing is the fact that the dominant silverback – Nshongi is not the oldest silverback in the group. Several ‘conspiracy’ theories surround his leadership role. One being that he has inherited his father, Mishaya’s dominant position before the patriarch dies. Peace and harmony currently prevail, but for how long? Nshongi’s unrivalled dominance could be under threat from Busasi, the aggressive young blackback who may soon contend for dominance. This is even more likely with the unsettling presence of the adult female Bwiruka who is a favourite of Nshongi’s and has also been known to have secret trysts with Bweza. What about the adult females in the family? Where do their loyalties lie? With three silverbacks in the family, each having mating privileges, the females in this group are spoilt for choice and it will be intriguing to follow the preferences of the females over this delicate matter of the available and eligible males in the family. How will the fortunes of this family unfold once the blackbacks mature into silverbacks? Friend them and follow the family drama.